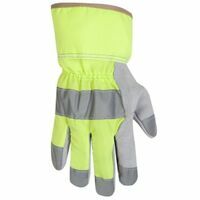 Striped cotton back and canvas-lined safety cuff, shirred wrist, continuous thumb, padded and leather palm for comfort even on tough jobs. CLC Work Gloves, Economy, One Size Fits All, Split Leather Palm, Cotton, Gray, Straight Thumb, Clute, Knit Wrist Cuff Economy split leather with cotton back and wrist. Rubberized safety cuff. Sizes: One size fits most. Split leather palm, leather index finger, leather finger tips, leather knuckle strap and pull, wing thumb, gunn-cut design, striped cotton back, patch palm and safety cuff. Ideal for metal fabricating, plant maintenance, lumber, or any application where severe wear is present. 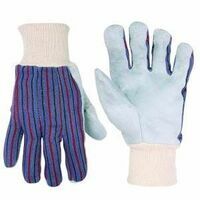 Men's cowsplit palm, clute cut color striped cotton back gloves. Knit wrist to keep out dirt. Select split leather palm, leather index finger, leather finger tips, and leather thumb and knuckle strap. Wing thumb design with shirred elastic back and striped cotton back with safety cuff. Ideal for metal fabricating, plant maintenance, lumber, or any application where severe wear is present. Shirred wrist with 2-1/2" rubberized safety cuff. Split leather palm, index finger, finger tips, thumb, pull and knuckle strap. Gunn-cut design with wing thumb, shirred elastic back, and rubberized cotton safety cuff. Ideal for metal fabricating, plant maintenance, lumber, or any application where severe wear is present. Split leather palm, index finger, finger tips, thumb, pull and knuckle strap. Gunn-cut design with wing thumb, shirred elastic back, and rubberized cotton safety cuff. Ideal for metal fabricating, plant maintenance, lumber, or any application where severe wear is present. Split cowhide leather palm with 4-1/2" extended gauntlet safety cuff. Rubberized cuff. Split cowhide leather palm with 4-1/2" extended gauntlet safety cuff. Rubberized cuff. Split leather palm, index finger, finger tips, thumb, pull and knuckle strap. Gunn-cut design with wing thumb, shirred elastic back, and rubberized cotton safety cuff. Ideal for metal fabricating, plant maintenance, lumber, or any application where severe wear is present. Split leather palm, leather index finger, leather finger tips, leather knuckle strap and pull, striped cotton back, wing thumb, gunn-cut design, rubberized gauntlet cuff. Ideal for metal fabricating, plant maintenance, lumber, or any application where severe wear is present. Premium split leather palm, index finger, finger tips, thumb, pull and knuckle strap. Continuous thumb design. Striped cotton back with rubberized safety cuff. Ideal for metal fabricating, plant maintenance, lumber, or any application where severe wear is present. Premium split leather palm, index finger, finger tips, thumb, pull and knuckle strap. Continuous thumb design. Striped cotton back with rubberized safety cuff. Ideal for metal fabricating, plant maintenance, lumber, or any application where severe wear is present. Double leather sewn inside the palm, thumb and forefinger, safety orange cotton back and cuff, leather knuckle strap and continuous pull on heavy safety cuff. Pearl grey grain pigskin leather palm, leather index finger, finger tips, and knuckle strap with a breathable cotton back. Shirred elastic wrist and safety cuff. Assorted Colors: Blue, Emerald Green. Ideal for metal fabricating, plant maintenance, lumber, or any application where severe wear is present. Suede palm with knit wrist and keystone thumb with gusset stitching. Breathable spandex back. Stretchable lycra finger side panels. Suede palm with knit wrist and keystone thumb with gusset stitching. Breathable spandex back. Stretchable lycra finger side panels. Suede palm with knit wrist and keystone thumb with gusset stitching. Breathable spandex back. Stretchable lycra finger side panels. Three pair pack full feature split leather palm with wing thumb for comfort and mobility, breathable cotton back for ventilation, shirred elastic wrist and rubberized cuff. Size large. Synthetic leather palm with spandex back for exceptional flexibility and comfort; double stitched in high wear areas for longer glove life; open cuff with shirred elastic wrist. Assorted colors: Orange, blue and green; sizes: M, L.